Pad printing by definition, also called tampography, is a printing process that can transfer a 2-D image onto a 3-D object. This is accomplished using an indirect offset (gravure) printing process, involving a silicon pad and a photopolymer plate stencil. These light sensitive plates are etched with the desired image through a process called post curing. Here at Technical Print, each order is dealt with personally; from start to finish, manually hand printed in our UK facility, by our highly skilled operatives to ensure each imprint is perfect every time. Pad printing is often interchanged with the phrase tampo printing. There is no limitation of objects that can be pad printed, and very few limitations with regard to materials we can print. As with all plastics, glass and metal printing, we run rigorous tests on each product to determine the adhesion and ink consistency most suited to the material used. We routinely tampo print everything from high specification automotive parts, monogrammed glassware and bar tools to medical grade organ storage and transfer boxes used in hospitals nationwide. We have a wealth of knowledge of pad and tampo printing to offer all customers, new and old, for any project they undertake. We can determine if the pad printing process is the correct route to take or if your chosen product would be more suited to Screen Printing, please click here for more information regarding this service. Feel assured you will receive a polite, professional and knowledgeable service with all enquiries and orders booked. Here at Technical Print, we have over 35 years experience printing on a variety of injection moulded plastics. We specialise in a range of automotive parts, for many popular car brands on the road today. We work closely with injection moulding companies up and down the country, catering to a variety of different industries from large scale power tool printing, to small, detailed prints on integral engine parts. Injection moulding is used to create many things such as wire spools, plastic packaging, bottle caps, automotive parts and components, pocket combs, some musical instruments, like the Ted Brewer Violins, mechanical parts (including gears), and most other mass produced plastic products available today. Injection moulding is the most common modern method of manufacturing plastic parts; it is ideal for producing high volumes of the same object. We use our many years experience in the industry to tailor our pad printing services upon the requirements of the customer. Prior to printing, we run a variety of tests on each sample we receive to determine the type of ink, ink thinner and method most appropriate for the product. This ensures minimum wastage of products and a maximum yield of stock, printed correctly, with perfect clarity and adhesion every time. For printing on domed products, or products that require consist increments between prints, such as cooker knobs, we would employ a technique called Rotary Pad Printing. This pad printing process combines the mechanics of Rotary Screen Printing with the quick convenience of Pad Printing. This specialised machinery employs the photopolymer plate stencils as a pad print machine would, and the rotary system of the Screen Printer. 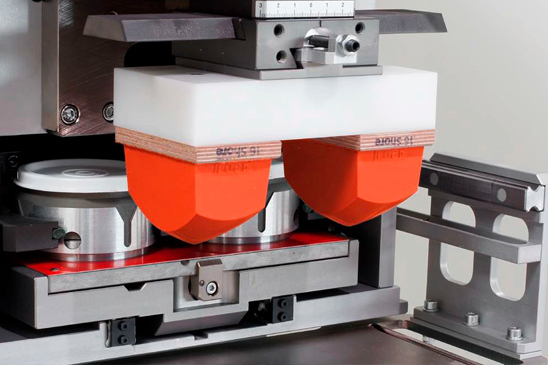 Ink is loaded onto a silicon pad and deposited onto the product via a rotating tooling system. We measure and use key registration points to gain perfect symmetry between pieces. This pad printing process can be applied to a variety of products, and is generally suited to smaller, more detailed prints. For further information regarding this technique, please contact us and we will be sure to assist you in any way we can.